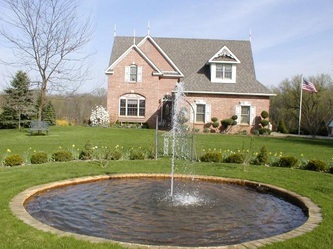 The Grand Rose in Eaton Rapids is an all brick country estate ideally located on 13 Acres aprox. half wooded and features exquisite gardens, views of the Grand River as 1 quarter mile of the river frontage is yours to enjoy along with exquisite hunting. The prestigious 2 story home is 3700+ sqft and custom built with fluted Victorian woodwork, rosettes and crown molding. Home features a cherry kitchen with marble floors, granite counter tops and Kitchen Aid appliances. Formal dining room offers great views of the property, a very intimate setting. Living room features a marble fireplace and 2 sets of French doors leading to the raised deck. Master bedroom suite features a fireplace, large walk-in closet, French doors leading to a private balcony and master bath with marble floor, shower and corner Jacuzzi tub. Large sunroom with built ins has a window seat. Laundry room has a built in pull down ironing board and extra room for a sewing room. Lower level features: full bath, office with oak wainscoting, family room with wood burning fireplace, full kitchen and dining area, all with a full wall of closet space. Very large 3 season porch offers great views and has ceramic flooring. 30×40 foot pole barn with attached 20×26 foot insulated and finished garden or party room with spiral staircase to the 16×20 foot loft. The garden shed could be used as a kids play house. All landscaped areas are fully irrigated and garage has hot and cold water. Energy efficient furnace, AC and water softener. Posted on July 30, 2012, in All Other Listings. Bookmark the permalink. Leave a comment.